First year teachers; In-service training; Handbooks, manuals, etc. Amazon.com description: Product Description: Teaching is a lifelong challenge, but the first few years in the classroom are typically among a teacher's hardest. 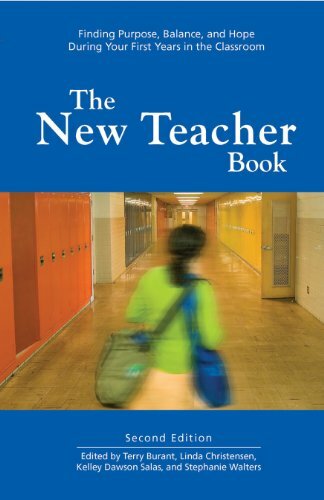 Since The New Teacher Book first came out in 2004, it has become an invaluable resource for new teachers entering the classroom. This expanded collection of writings and reflections - some by new teachers, others by veterans with decades of experience to share - offers practical guidance on how to effectively navigate the school system, form rewarding professional relationships with colleagues, and connect in meaningful ways with students and families from all cultures and backgrounds. The New Teacher Book will help new teachers, from kindergarten through high school, sustain the passion and ideals that led them to teaching, and channel that energy into the day-to-day reality of working in a school. With Linda Christensen (other contributor), Stephanie Walters (other contributor), Kelley Dawson Salas (other contributor) | 2 edition from Rethinking Schools Ltd (November 1, 2010); titled "The New Teacher Book: Finding Purpose, Balance and Hope During Your First Years in the Classroom"
About: Teaching is a lifelong challenge, but the first few years in the classroom are typically among a teacher's hardest.